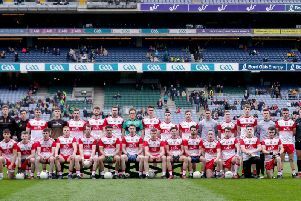 Derry Minors justified their favourites tag to reach a third successive Ulster final with a 17-point dismantling of Antrim in Clones on Sunday but Damian McErlain will not is not about to start celebrating just yet! McErlain’s team produced a devastating opening and finished with aplomb as a first half penalty from Conor McCluskey and Oisin McWilliams’ late brace put the seal on the most emphatic of performances. Derry will now meet either Down or Cavan in the July 16th final back at Clones but when pressed on whether this squad could be the best of the three he has led to the provincial final, the Magherafelt man was as emphatic as his team. While all else around him might get carried away by the potential of this Oak Leaf panel, there’s no danger of that with McErlain. Yet it’s easy to understand the hype. Antrim arrived in Clones having shocked Donegal in Ballybofey but they were never in the match after McCluskey’s penalty and three early Ben McCarron points set Derry on their way to an interval lead of 1-10 to 0-3. “We knew if we got the work-rate right that we could kick on and do the job. Derry’s used a very effective high press on the Saffron kick-out which kept the Oak Leafers on the front foot and left almost out of the game before they had worked out how to respond. “We just felt that we should target their kick-outs, it was a way in which we thought we would not let them get primary possession. We wanted to make it a man-to-man battle. “That worked for us because our work-rate was serious throughout the match. We were moving off the shoulder really, really well. As a matter of fact, the boys were really tired after about 15 or 20 minutes because the heat was very intense out there on the pitch. Despite a brief Antrim revival at the start of the season half, Derry took control once more in the third quarter with the game won long before the final whistle meaning all eyes will turn to next weekend’s second semi-final. “Yes, we will see how the Down v Cavan semi-final goes at the Athletic Grounds next Saturday. They are both excellent sides. Cavan beat the favourites for the whole thing in Monaghan. Derry: O Hartin; O McGill, C McCluskey 1-0 (1 pen), S McKeever; S McErlain, D Rafferty, C McShane; P McGrogan, O McWilliams 2-2; P Quigg 0-2 (1f), R Mullan 0-1, D Cassidy 0-1; B McCarron 0-4, L McWilliams 0-2 (1f), M McGrogan 0-1. Subs: T McHugh 0-1 for M McGrogan (40), F Mortimer 0-3 for P Quigg (40mins), C Brown for Cassidy (44mins), C Murphy for Mullan (44mins), M Bradley for McErlain (57mins), T Walsh for McWilliams (57mins). Antrim: M Byrne; E Nagle, J Toner, A Mulholland; E Kelly, E McCabe, J McCaffrey; E Gibson, J Maybin; D McErlaine 0-3 (3f), T McAteer, J Gribbin; L Quinn 0-1 (1f), D McEnhill, R Kelly 0-3 (1f). Subs: J Linehan for Toner (19mins), P Henvey from McEnhill (19mins), R Brolly 0-1 for Maybin (32mins), S Duffin 0-1 for Gibson (HT), M Doherty 0-1 for Nagle (40mins), K McCann for Gribbin (51mins).